TAMPA, Fla. — It was too big to be a fox and too agile to be a dog. It definitely didn’t belong in the pasture, where Anna Angel had become well acquainted with the herd of grazing cows and their tottering offspring while waiting for the traffic light to change at Brooker and S. Valrico roads. So when Angel spotted the strange grey animal just after 7:30 a.m. on a Monday, and then another and another, Angel parked her car along the pasture’s rusty wire fence for a closer look. Coyotes. At least three and possibly more waiting in the nearby wood, creeping toward the unsuspecting cattle. Angel was one of about 40 residents who came on a Wednesday night to the Bloomingdale Public Library to get more information from the Florida Fish and Wildlife Conservation Commission about why coyotes would want to move to their sprawling suburb – and what to do to keep them out. The commission’s “urban coyote” expert, wildlife biologist Angeline Scotten, came prepared with a presentation she’s making more often these days in suburban neighborhoods across the state. But this was the first time anyone has held such a talk in Bloomingdale, an east Hillsborough bedroom community. County officials asked someone to come meet with residents in the area after a Seffner woman nearly lost her finger during a suspected coyote attack in late November. DNA evidence collected by the commission showed that the animal responsible for attacking 83-year-old Olga Colon, and killing her pet chihuahua Pinky, was actually a large domestic dog. But the incident sparked a rash of calls from the area about coyote sightings that were very real. In 2018, the commission’s Wildlife Assistance Program received about 1,000 calls statewide. That’s about 200 more calls than in 2017 and about 300 more than in 2015 and 2016 officials said. The highest volume of calls has come from Pinellas County for several years, Scotten said, though Hillsborough and Pasco counties aren’t far behind. There aren’t many places in the U.S. where coyotes aren’t breeding pups, including Central Park in New York City, Scotten said. The canines’ native habitat was once the dry, open expanses of the western United States. But like humans, coyotes have slowly expanded their territory across the nation by quickly adapting to disturbances in their natural habitats. Coyotes have learned to thrive in the same urban development that has caused other predator populations to decline. They can cross bridges, swim canals, and navigate sidewalks while hunting for food, Scotten said. A coyote’s dream home, though, would be in a suburb like Bloomingdale, where densely packed developments are surrounded by farms and pastureland – a small taste of the open range prairies they used to roam. “Now, especially in areas like Bloomingdale, the coyotes appear to be living in rural environments but coming in to urban areas to get food since its easier,” Scotten said. Humans likely brought the first coyotes to Florida to train hunting dogs in the 1920s, but many scientists believe they now fill the role in Florida’s ecosystem that red wolves left behind. The animals help keep Florida’s rodent, raccoon and fox populations in check, but are known to prey on cattle, turkeys, chickens or unsuspecting house pets. 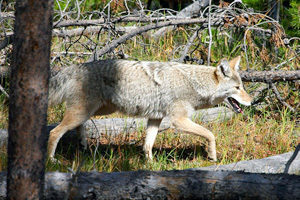 Coyotes are most active near dawn and dusk, and will eat anything that a dog, cat or raccoon would eat, Scotten said. That includes pet food left outside, garbage bags waiting on a curb, over-ripe fruit that’s fallen off a tree or animal feed stored in an open-air barn. Unlike cats or dogs, though, coyotes are extremely difficult to trap and are known to easily jump fences up to 6 feet high. FWC officials say the best way to keep coyotes at bay is to “haze” them whenever they venture too close for comfort.